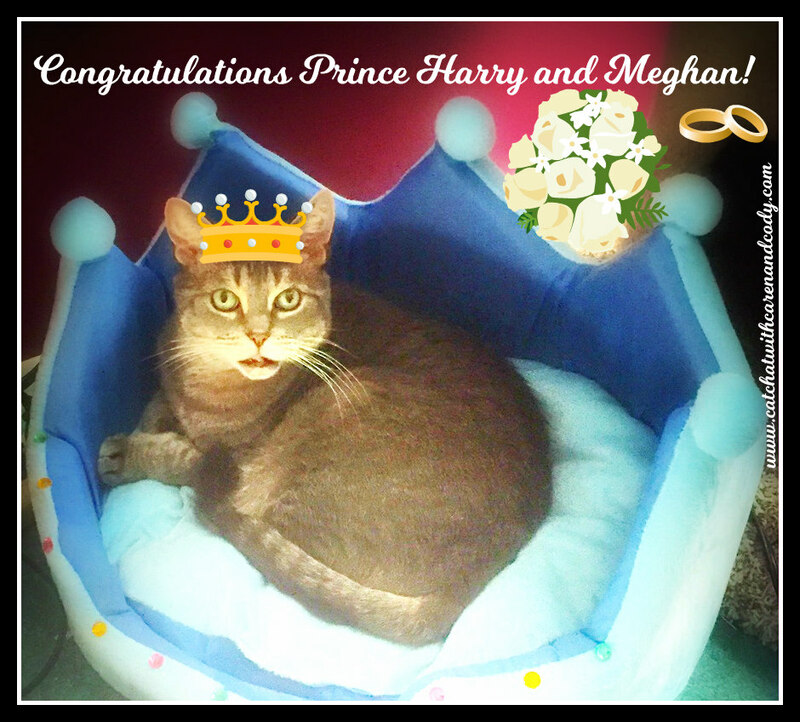 Cat Chat With Caren And Cody: Celebrating the Royal Wedding with the "Cat formerly known as Prince"
Celebrating the Royal Wedding with the "Cat formerly known as Prince"
Hi all it's Cody and oh what a special day it is! Today Prince Harry and Meghan Markle are getting married!! When I was adopted my name was actually "Prince." My Mom calls me "the cat formerly known as Prince." I thought it was only fitting that since I started my life as a "prince" that I would celebrate this most wonderful and momentous occasion by posing in my Royal Prince Bed! I am recording it so I can hurry through it. I got up and watched Charles and Diana. It was before DVRs. LOL! My human is probably going to watch the highlights when she gets up. She needs a good night's rest. I need a good night's rest and am lucky on the nights I sleep 6 hrs. I usually sleep much less! I got up to watch at 5:30 am and had gone to bed at 1:30 am. My momma wants to see da DRESS! OMC the dress was STUNNING! Everybody finds something fascinating in different things. Dad says it's ridiculous the hubbub over this wedding and the amount of excitement surrounding it and amount of time people are devoting to it. Having just returned from my trip to London, I cannot help but tune in! So many things are delighting me: the music, surprisingly...the hats!...the cathedral...and the children. I'm not much of a royal watcher and swore I wouldn't tune in. But I've been watching since I got up at 4:30. LOL. Right in the middle of the ceremony even as I type. And yep, I've already bawled my eyes out, I'm such a sap. I got up at 5:30 so you have ME beat! I LOVED every minute!! I also cried, it was just beautiful and Meghan looked stunning!!! Oh, we love that your Mom calls you that! Too funny. You are definitely still a Prince, Cody. We have the big wedding on, but we're just kind of half watching/listening. We always have the TV on in the morning (local news), but since it's on every channel we don't have that much choice (other than silence - LOL). You look most Royal Cody! We were hoping to avoid the wedding thing but it was everywhere! Every cat is a prince or princess. My cat is a Queen. As for the royal wedding I missed it totally because I was sleeping. I did get to the end of the ceremony after they were pronounced man and wife. She looked gorgeous. I thought her dress was plain but elegant. You look good with a crown on your head Cody. I am a Princess. But I have no crown. Meghan's wedding dress was so nice. You are a prince among cats, Cody. I have watched bits and pieces of the wedding in between gardening. "Prince among cats" I LOVE it!! So cute, Cody! I love the crown. You are one handsome cat! Awww thank you soooo much!!!!!! Yes the bride was lovely and the groom too. But the hats! Don't you think there should be a Kitty Fascinator Day for the lady cats? I curled up on the couch and watched the wedding with my kitties! I loved every minute of it! You are still every bit the prince and look ever-so-handsome in your crown! Purrs from Deb and the Zee/Zoey gang. My Mom and I did the same! Thank you soooooooo much! We loved the wedding, it was beautiful! Love from all of us! You look so good in that crown, Prince, er I mean Cody. Yep, I watched the wedding! We couldn't stay up to watch the wedding live, but saw the highlights. It was a beautiful ceremony and celebration! Love that bed, Cody! We remember WAY back when you saw the one we had on our blog, which sent your mom on a quest to find one for you. It suits you purrfectly. We were watching! It was so beautiful. That was some wedding wasn't it?! oh YES we LOVED it!! We watched and it was lovely. We wish them all the best! What a cute pic! I think we're the only ones who had no innerest. Hello, former Prince...Prince Cody that is...MOL! That sure s a princely bed you have there! Comfy too, I bet. We didn't watch the weedig but we did see some of the highlights later. It was lovely, wasn't it? !